Southampton Football Club have reached an agreement with Lille to secure Sofiane Boufal’s services for a club-record fee. The Saints have reportedly spent £16 million to bring the Moroccan International to St Mary’s Stadium, breaking their previous record of £15 million they paid for the services of Dani Osvaldo, who joined from Roma in 2013. 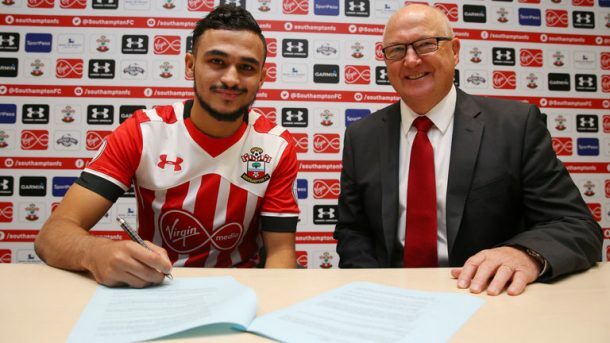 Boufal has signed a five-year contract with the Southern club as they completed their sixth signing of the summer, becoming the tenth English Premier League club to break their transfer record fees. The 22-year-old started his professional career at French side Angers and made his debut in the French second division at the age of 18, before joining Lille in January 2015 for a fee reported to be around €3 million. In his first season with Lille, Boufal scored three goals and provided 7 assists in 16 games before continuing to impress in his first full season, as he scored 12 goals in all competitions; helping them finishing fifth in Ligue 1 as well as reaching the French Cup final, which they lost 2-1 to Paris Saint-Germain. It’s worth noting that Sofiane Boufal was named Africa’s best player in France last season, after he beat Senegal’s Cheikh Ndoye and Algeria’s Rachid Ghezzal.